We are now half way our course Crossmedial Exhibitions of our Master Comparative Arts & Media Studies. Yearly, we have an exhibition in focus which is either crossmedial because of the artists him- or herself or because of the crossmedial creation of the exhibition by the curator. 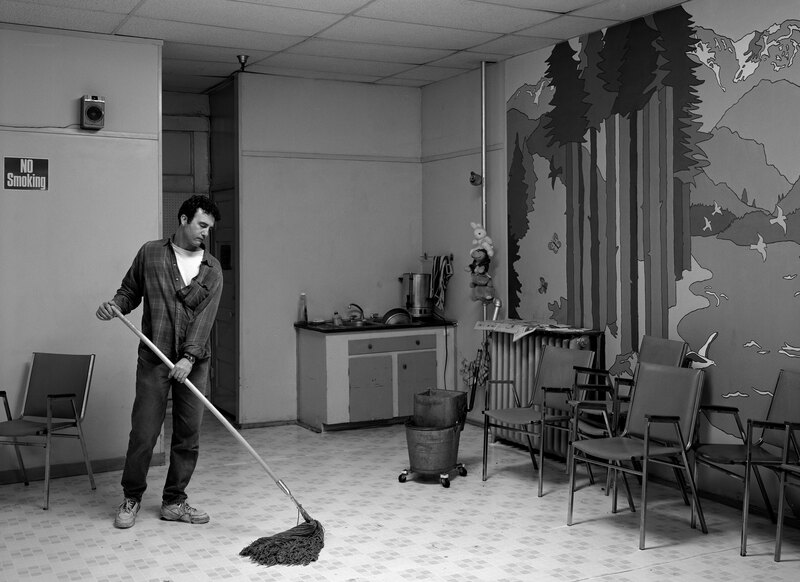 This year’s exhibition is Jeff Wall. Tableaux-Pictures-Photographs, 1996-2013. 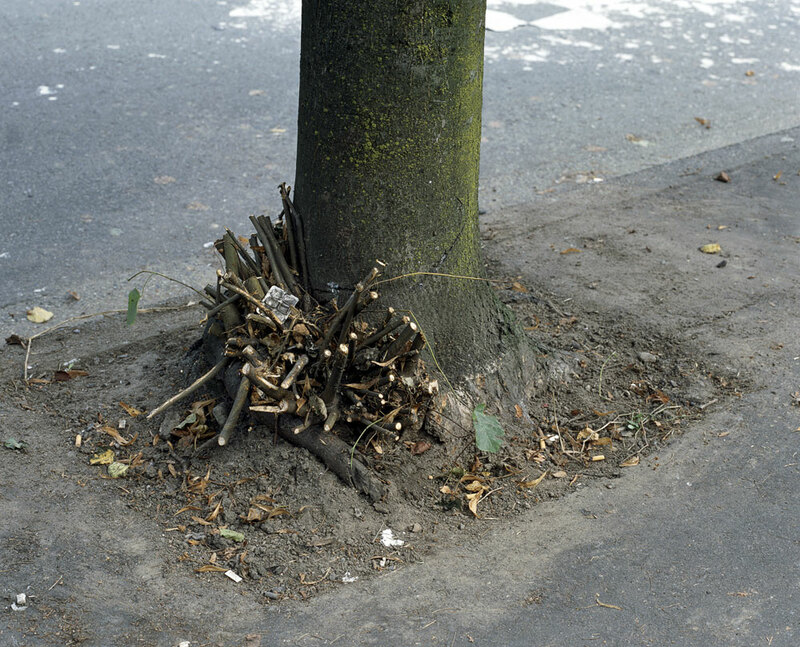 The exhibition at Stedelijk Museum, Amsterdam, focuses on the later work of Wall, taking the year 1996 as starting point when Wall started to work with black and white photography – though he never discarded his work with colour photography with lightboxes for which he became famous in the first place. So the exhibition shows some 40 photos: lightboxes, b&w prints and colour prints. The colour prints include a diptych never shown yet: Summer Afternoons (2013). After a presentation on the phenomenon of crossmedial exhibitions and on previous exhibitions in focus at Boymans, Van Gogh Museum, Amsterdam Museum, and EYE, we had a thorough discussion on literature dealing with the museum of the 21th century, including Michelle Henning and Eilean Hooper-Greenhill. We already had two fascinating meetings with the museum staff over the last two weeks, dealing with issues of curatorship, selection, the museum’s focus on solo exhibitions, the negotation with the artist, the narrative of the exhibition, and photography at the Stedelijk Museum; Public Program and education; communication, marketing and press (in general and in particular for this exhibition). This Monday we’ll have our third and last meeting about logistics & policy but also returning to curatorship. Yesterday, at the opening, several people started to associate with the life-sized, sometimes tableau styled photographs, drawing relations between the depicted humans (the characters) and the objects surrounding them, inventing complete stories of what happened here, but also before and after. The pictures clearly invited to have this instant narrativization. The photographs also have a strong cinematic feeling: they could have been moments of narrative cinema. Especially the lightboxes with their increased lighting, resembling studio film lights, suggest this. Wall’s photographs aren’t really about exact cinematic quotations, but rather suggest a feeling of the “cinematic” in general. Today, after an introduction by Visser on how she wanted to do something different from previous chronologic, linear exhibitions or previous divisions in genres – or for that matter an explicit connection with Wall’s inspirational sources like was done in Brussels in 2011 – Wall himself had a speech about his own explanation of the title, his development and his recent ideas about his own art. His statements were sometimes puzzling as they seemed to contradict what I saw just one day before. For various reasons the photos avoid direct identification or confrontation, in contrast with his early work Picture for Women. We are dealing now with a disavowed contemplation, even if it is clear the maker must have felt compassion for his characters or his situations. This is enforced by the various characters looking away from the camera, bowing their heads or offering us the backs of their heads. This sharply contrast with, again, Picture for Women, which – in filmic terms – breaks the diegesis because of its direct adress. In these later works Wall keeps up the diegesis. While most of Wall’s pictures deal with characters (you might also call them extras) in a setting, the often stunning sets seem to be ignored by the depicted humans. 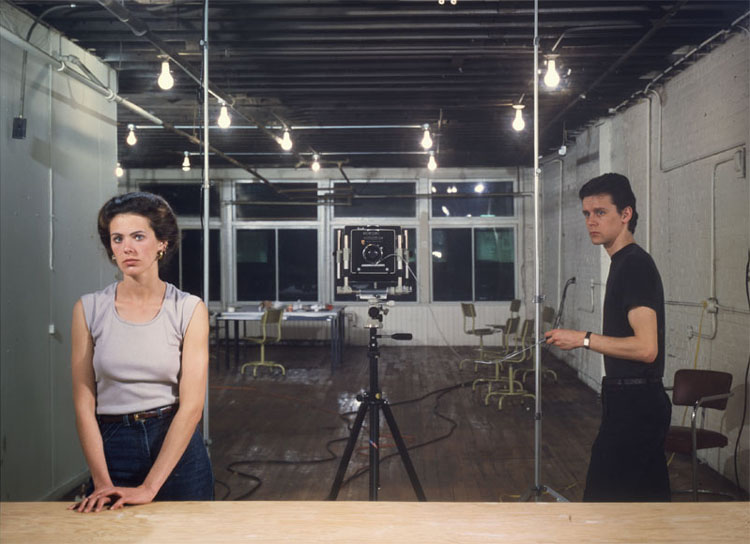 I was quite intrigued by Wall’s less recurrent examples of photos in which humans are absent but have left their traces, a bit as in Samuel van Hoogstraten’s paintings or in Michelangelo Antonioni’s film L’eclisse (1962). In the latter film the quintessential location for the two protagonists is an ordinary crossroads in EUR, then a new quarter at the southside of Rome. Here the two meet, as the woman lives nearby. 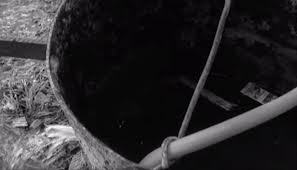 Antonioni focuses on detals of the location: a tree covered with ants, a sewer, a jockey riding on a tilbury, a nurse pushing a pram, a tank filled with water. As Vittoria (Monica Vitti) throws in a little piece of wood that floats on the surface, the tank is appropriated as part of her life, just like the zebra that becomes a prop for her indecisiveness. In short, Antonioni monumentalizes a totally un-monumental site. When in the last twenty minutes the two protagonists don’t show up anymore at the location, we still associate all the elements we see again as part of their life. We still see the wood floating in the tank. The ‘extras’ continue their routines. But we wait in vain for the leading couple, who despite their promises have each decided not to reunite. ~ by Ivo Blom on March 1, 2014.